IF YOU cannot wait for the next episode of Dr.	Who on TV you can always read his latest adventure. 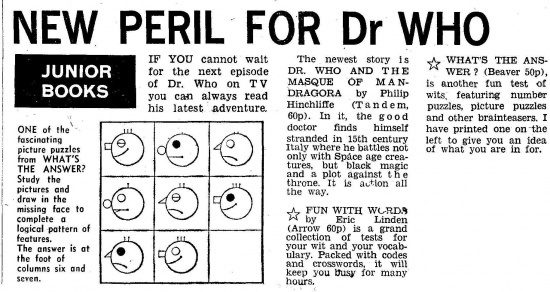 The newest story is DR. WHO AND THE MASQUE OF MANDRAGORA by Philip Hinchliffe (Tandem, 60p). In it, the good doctor finds himself stranded in 15th century Italy where he battles not only with Space age creatures, but black magic and a plot against the throne. It is action all the way. APA 6th ed. : (1978-02-11). New Peril for Dr Who. The Mirror p. 21. MLA 7th ed. : "New Peril for Dr Who." The Mirror [add city] 1978-02-11, 21. Print. Turabian: "New Peril for Dr Who." The Mirror, 1978-02-11, section, 21 edition. This page was last modified on 31 July 2017, at 22:53.